$220.068 thousand on 30 screens. Because I claim to be both a big fan of sports and movies, it shames me to admit I never saw 1986’s Hoosiers until more than 25 years later. But better late than never, as they say, so I was happy to finally check out the much-loved flick. Set in 1954, Norman Dale (Gene Hackman) comes to small Hickory, Indiana to coach high school basketball. This is his first coaching gig in more than a decade, and he encounters a mix of challenges – not the least of which comes from his own checkered past. A former college coach who ran into problems there, the job acts as Dale’s last shot at redemption. In addition, Dale runs into an extremely conservative town, so a lot of the locals resist his attempts to change. (“Zone defense is all we’ve played in the past and is the only thing that’ll work this year.”) Dale alienates many with his unusual practice/training methods, and also causes a stir when he brings on town drunk Shooter (Dennis Hopper) – a one-time high school hoops star himself – as his assistant. Adding to the trouble, Dale recruits an undersized team that lacks star player Jimmy Chitwood (Maris Valainis) and finds it tough to work with the general lack of talent. Despite all these obstacles, Dale brings the team together and makes a highly improbable run at the state championship. I must admit I wish I’d seen Hoosiers back in 1986 so I wouldn’t have to consider all its imitators since then. Granted, the movie’s underdog theme wasn’t particularly original even in 1986, as we’d seen scads of flicks in which an individual or team overcame the odds to achieve sporting success; heck, we’d even viewed another one that took place in Indiana. So why might it have mattered if I’d seen Hoosiers 25 years earlier? Because while it may not have been all that fresh in 1986, it certainly seems even less so in 2012. Hoosiers is well-liked enough to spawn plenty of its own imitators; that means that through no fault of its own, it’ll come with a certain “been there, done that” feel that may not have existed in 1986. Of course, if I discredited every movie I saw in the 21st century because it’d inspired multiple imitations since the 20th century, I wouldn’t have much to like, so in no way can I hold the success of Hoosiers against it. While its nature makes it predictable at times, that doesn’t cause real problems, as the movie does more than enough right to overcome those drawbacks. In particular, the film delivers due to its low-key nature. Despite the potentially sappiness of the story, Hoosiers stays reasonably restrained. Of course, it aims for an emotional connection, but it doesn’t beg or pester the viewer to get there. Most films of this sort tend to overwhelm with their attempts to evoke a strong response, but that doesn’t happen here. Hoosiers also boasts a strong cast. Hackman doesn’t embrace the soppy side of things, and he helps ground the tale well. Hopper and Barbara Hershey bring depth to the film, too, and the basketball players are just solid enough to keep the flick afloat. Actually, that leads to one of the movie’s weaknesses: it doesn’t provide a lot of depth. The film fails to develop its characters terribly well, and it also tends to trade in clichés; as I’ve noted, there’s not a lot about the underdog tale that’s especially fresh here. Nonetheless, the execution of the story has just enough going for it to make Hoosiers enjoyable. While I don’t think it’s as good as its enduring popularity indicates, I do find it to provide a likable drama. 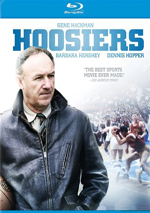 Hoosiers appears in an aspect ratio of approximately 1.85:1 on this Blu-ray Disc. This was an attractive presentation for the most part. Overall sharpness worked well. Some light softness interfered at times – especially in wider shots – but the majority of the film showed good clarity and accuracy. No issues with jagged edges or shimmering occurred, but I saw occasional, light edge haloes. In terms of print flaws, I noticed a couple of small specks but nothing more. Colors seemed fine. The image opted for a semi-sepia feel typical of period pieces, and it lacked much in terms of vivid hues. Within those constraints, the hues were solid, as they showed positive reproduction. Black levels tended to appear reasonably dark, while shadow detail was fairly clear; some low-light shots appeared a smidgen murky, but those were the exception. I admit I was surprised at how good Hoosiers looked, as based on its era and origins, I thought it’d be grainier and fuzzier than it was. In fact, at times I wondered if perhaps the image got spruced up a little too much; while I didn’t see overt signs of excessive noise reduction, I did think the movie could be a little too peppy and clean at times. Nonetheless, it was still quite satisfying, and if it did use various “clean-up” techniques, it didn’t go over the top with them; you’ll still see grain and the usual “80s look” to the film. Overall, the movie really looked quite good. As for the film’s DTS-HD MA 5.1 soundtrack, it seemed adequate. This wasn’t a movie that needed an ambitious soundscape, so don’t expect a lot from its use of the various channels. Music showed decent stereo spread across the front, and some effects emanated from different speakers. These managed to open up some scenes – mainly the basketball games – but a lot of the track appeared to pretty much remain monaural; this wasn’t a soundfield that tried to dazzle us, which seemed logical. Audio quality was acceptable. Speech seemed a bit wan but offered reasonable clarity and lacked problems like edginess. Music appeared similarly thin; the synthesized score didn’t sound tinny, but it didn’t have a lot of oomph. The same went for the effects, though they didn’t play a major role; outside of the basketball scenes, this was a chatty flick. This was a perfectly decent 1980s soundtrack that merited a “C+”. How did the Blu-ray compare to the Special Edition DVD from 2005? Both improved. The audio showed a superior soundfield; the DVD’s soundscape suffered from awkward localization, while this one felt more natural. The image offered a cleaner, tighter presentation. I thought the Blu-ray provided a nice jump up in quality. The Blu-ray’s extras replicate most of those from the SE DVD. We open with an audio commentary. The latter features director David Anspaugh and writer Angelo Pizzo, both of whom sit together for this running, screen-specific chat. They discuss the project's roots and development, story and character areas, sets and locations, editing and cut/altered sequences, cast and performances, and a few other areas. Overall, this becomes a good commentary. On the negative side, the track occasionally sags, but those gaps occur with reasonable infrequency. Anspaugh and Pizzo mesh well and usually create a likable, informative chat that lets us know quite a bit about the film. Next we go to a featurette called Hoosier History: The Story Behind the Legend. 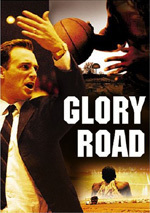 It goes for 29 minutes, 48 seconds and includes notes from Anspaugh, Pizzo, Milan High coach Randy Combs, producer Carter DeHaven, former Indiana Pacers coach Rick Carlisle, former Pacers player Reggie Miller, ESPN’s Bill Simmons, former Purdue University coach Gene Keady, 1953-54 Milan High players Bob Plump, Glen Butte, Ray Craft, and Roger Schroder, 1953-54 Muncie High players Jimmy Barnes, director of photography Fred Murphy, and actors Dennis Hopper, Gene Hackman, and Maris Valainis. 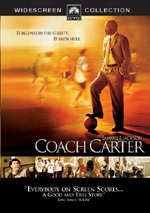 “Legend” looks at the story that inspired the film, the movie’s roots, script and development, cast and characters, locations and sets, shooting the basketball scenes, and the flick’s reception. Though not exactly a hard-hitting program, “Legend” delivers a decent enough examination of the flick. It tends to feel fairly superficial, but it’s nice to meet some of the real players and contrast the reality with the fantasy. This ends up as a watchable little piece but not anything dynamic. For something especially compelling, we get the Milan Vs. Muncie 1954 Indiana High School Basketball Championship Game. This archival footage fills 41 minutes, 26 seconds and shows the contest featured in the film. While it looks and sounds pretty terrible, it’s an awfully cool addition to the set. In addition to the film’s trailer, we locate 13 Deleted Scenes; these fill a total of 31 minutes, 13 seconds. (That total also includes intros from Anspaugh and Pizzo.) Most of these embellish characters and fill in a few expositional dots. Of course, some are better than others, but I’d be hard-pressed to cite any that should’ve remained in the final flick; they’re usually moderately interesting but not especially memorable. Does the Blu-ray drop any of the DVD’s extras? Yup – it loses a photo gallery. I don’t know why so many Blu-rays omit already-existing collections of stills, but it doesn’t surprise me when this occurs. Over the years since its release, Hoosiers has become a much-beloved “underdog” drama. Does it deserve its legend? To a certain degree. 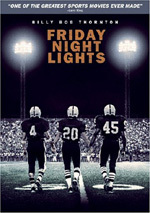 While not a great film, it does deliver an emotion, spirited take on the genre. The Blu-ray comes with pretty good picture and audio as well a nice set of supplements. I felt happy with this 2012 Blu-ray of Hoosiers, as I’m sure it’s easily the best home video representation of the film to date.